Haru is a normal high school girl who’s going through the normal teenage stuff; the boy she likes doesn’t notice her and she lacks self-confidence. On her way home from school, she saves a cat from being run over and he thanks her. Yes, the cat thanks her. Later that night, cats come to her house, the King specifically. These cats tell her that the cat she saved was the Prince and to thank her, they will be giving her gifts. Haru’s mother tells her that she actually told her when she was a kid that she could talk to cats. The next day, she finds out that the gifts are catnip and mice! One cat comes to make sure she’s enjoying her gifts, but tells her that she’s been offered the Prince’s hand in marriage. Haru’s shocked reply is mistaken as an agreement, which is very bad. 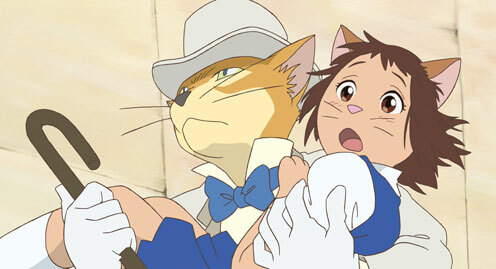 Haru overhears a voice that tells her to find a big white cat and ask to be taken to the Cat Bureau. The voice tells her that they will be able to help her. This is how we meet Fatso, I mean Muta. ^_^ He takes her to the Cat Bureau to meet the Baron, but before he can help her, she is kidnapped, or should I say catnapped? They are taken to the Cat Kingdom, where she is now the same size as the cats. 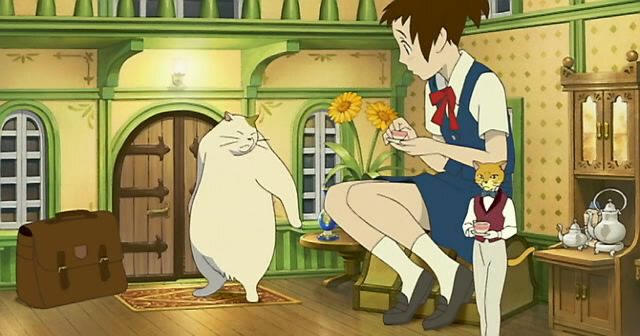 Haru is taken to the palace where she realizes she’s becoming a cat. The Baron rescues her, but they have to get to the top of the tower in order to return home and in order to get to the tower, they have to get through the King’s maze while guards are coming after them. Haru is such a great character. She’s normal in almost every way except that she can talk to cats. Baron is the best though; he’s noble, brave, and so sweet. Muta is hilarious, especially his fights with a crow named Toto. The voices of the characters are some of the best. Anne Hathaway voices Haru, which is perfect! Baron has a British accent, which I think fits him the best. The main song in the film is Kaze ni Naru by Ayano Tsuji. I love this song so much. Every time I listen to it, it immediately reminds me of the movie because it fits so well. My biggest problem with the film is that it ends! I want so badly for her to go back to the Cat Bureau and see Baron again. There needs to be a sequel. Seriously. 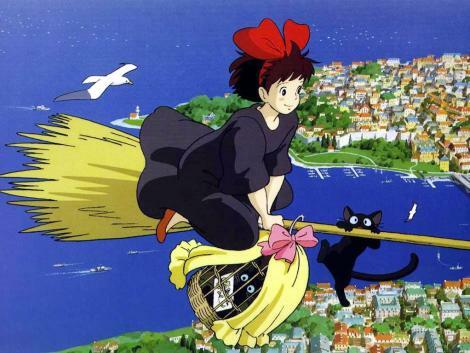 Kiki’s Delivery Service is another one of the many Studio Ghibli films that will steal your heart. There’s nothing like Studio Ghibli to make you feel happy and free. It’s the only way I can describe it. I grew up on Totoro and Kiki’s Deliver Service was my second Studio Ghibli film I ever saw. I’ve seen it so many times since then. I’m 22 and I still love watching these films and I feel like a carefree kid again when they’re done. Kiki is a young witch who just turned 13. It’s a custom that whenever a witch turns 13, she takes off on her own for a year to train her abilities. She is excited about becoming independent and leaving home for the first time just her, her broom, and her best friend, her cat, Jiji. Her mom and dad see her off on a clear full moon. The clear night quickly turns into a rainstorm and she gets into a train to stay dry. After falling asleep, the train moves and takes her to a sea-side town. She decides that this is where she’ll live. There’s only one problem. Kiki has nowhere to stay and not much money. She finds a bakery and a nice woman who works there says she can stay as long as she can watch the store sometimes. Kiki decides that, since flying is the only skill she has, she’ll start a delivery service. It takes off! However, she starts to lose her confidence as a witch and her powers begin to fizzle. She can’t talk to Jiji anymore and she also can’t fly. Her boss is understanding and tells her that she needs to rest. She has to find her confidence and the reason she flies in the first place in order for her powers to return. Of course, there are some characters that I have to mention. Kiki is so sweet and helpful. She wants to help everyone and is quick to lend a hand. 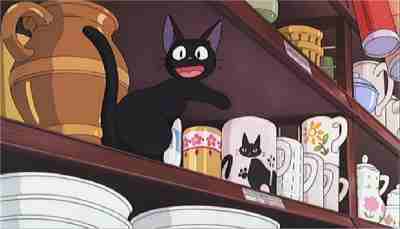 Jiji likes to take the safe way out of every situation. He’s always trying to tell Kiki to slow down. 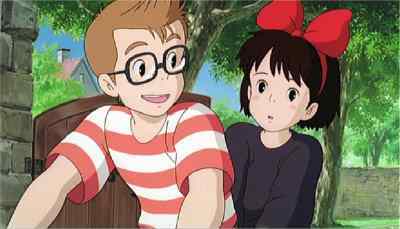 Tombo is a friend Kiki makes; at first, she doesn’t like him, but later on they become really good friends. He’s funny and is always nice to Kiki. Osono is her boss at the bakery who is pregnant during the movie, but she’s always busy and willing to help Kiki with anything. Ursula is a painter that helps Kiki out during her hard times when her powers are at a low. 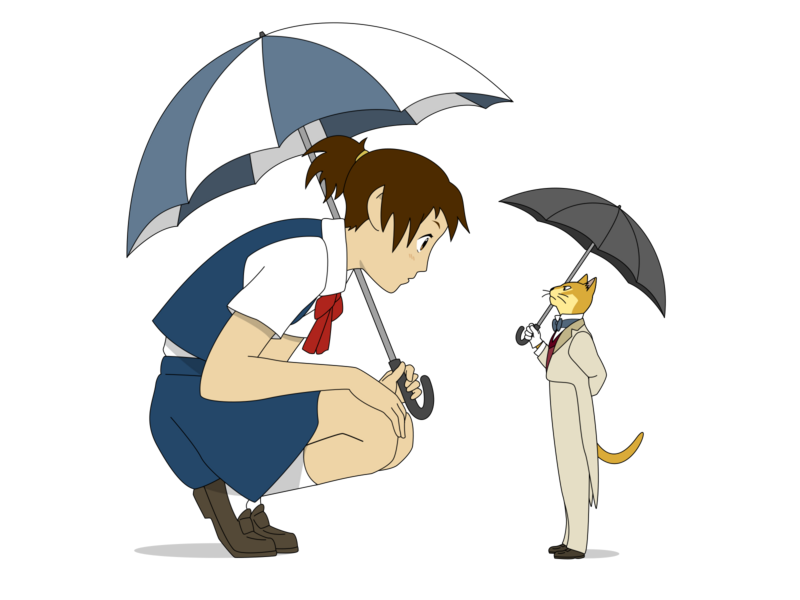 She teaches Kiki that you have to believe in yourself. This movie is truly magical, which is expected of a Studio Ghibli movie. The English voices fit the characters perfectly and the music is one of my favorite parts. There are two songs by Sydney Forest that I find addicting. I’m singing along to them as I’m writing this. The beginning song is called Soaring and the ending song is called I’m Gonna Fly. In the Japanese version the songs are different. The opening is Message of Rouge and the ending is Yasashisa ni Tsutsumareta nara, both by Yumi Arai. As with all Studio Ghibli movies that I’ve reviewed, I can’t say anything bad. These are close to my heart. I know they’ll be close to your’s too. This review has been long awaiting post. I originally did this review after the film came out in English. However, I’ve done some editing based on new opinions and watching it many more times. I believe it’s a must to watch a Studio Ghibli film at least twice before reviewing it; you’ll get a much better opinion that way (especially if you grew up on them). I’ll try my best to not be bias seeing as this is one of my favorite movies. Studio Ghibli films leave an everlasting impression. You fall in love. 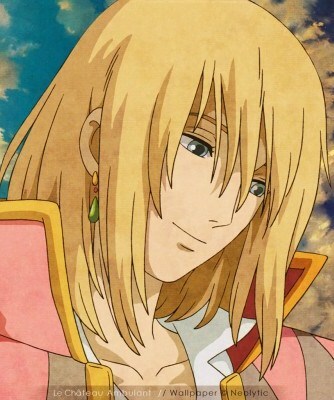 Howl’s Moving Castle certainly is no exception. This is a movie you will want to watch over and over again. When times are rough, you’ll watch it to escape into this world of witches and wizards. Sophie (pictured above) is a girl who works at a hat shop that was owned by her father. She’s very ordinary in appearance compared to her beautiful sister and their mother. When Howl, a wizard with a bad reputation, saves her from a couple of indecent soldiers on her way to see her sister, she is thrown into a feud between Howl and The Witch of the Wastes. The Witch then casts a spell on Sophie making her very old. Sophie’s only option is to leave. 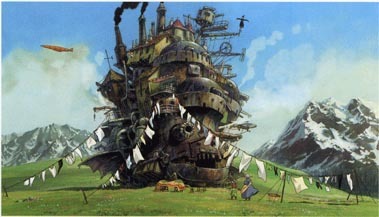 She travels out into the Wastes and ends up taking refuge in Howl’s Moving Castle as a cleaning lady. She has to find a way out of the curse while also dealing with a war going on in the world around her. 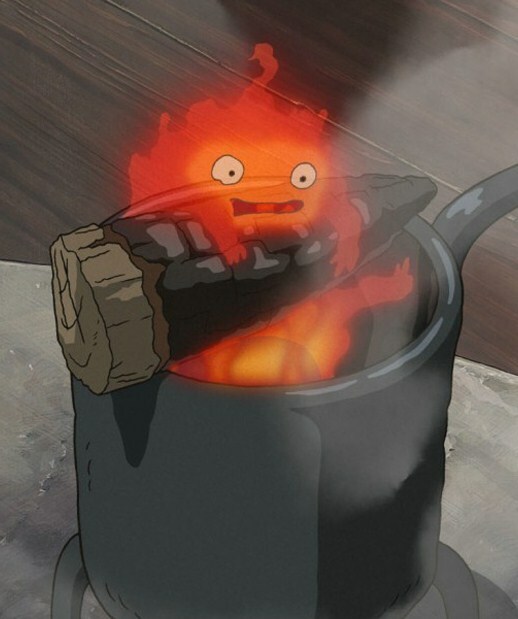 She makes a deal with the fire demon, Calcifer, that if she helps him with the curse holding him to Howl, then he will help her out of her’s. Not only do you fall in love with the story, but you fall in love with the characters. Each character is so different. Most of the time I hate the main girl characters because they’re usually so frail and ignorant, but Sophie is courageous, mature, and kind. Howl (left) is a handsome wizard with a bad reputation for eating the hearts of lovely girls, but he’s really a kind and loving person. You’ll love the other characters, too, like Calcifer (right), the fire demon, & Markl, Howl’s young apprentice. Calcifer is your main comic relief as Sophie is constantly torturing him. 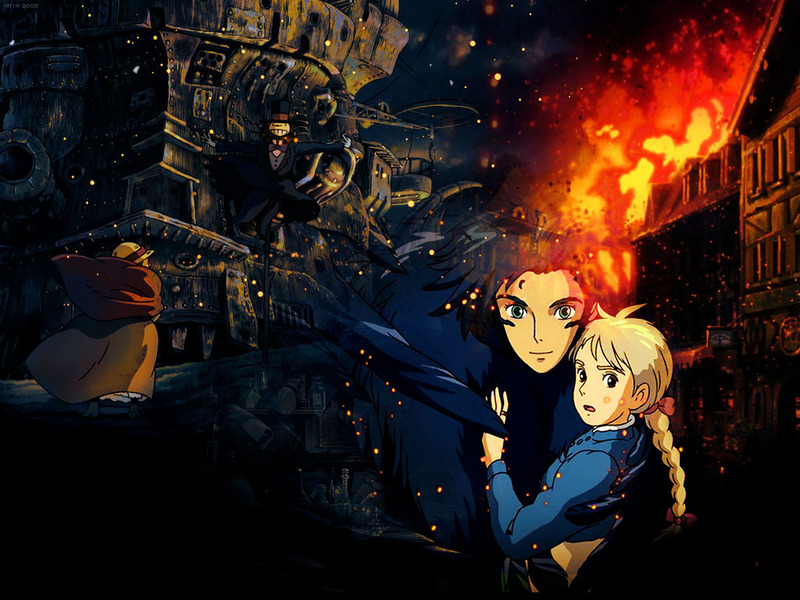 Usually, I have at least a couple problems with any anime, but with Howl’s Moving Castle and any other Studio Ghibli film, I have none. Correction, I do have one problem…it ends. Even the voices for the English version are fantastic. I’m not a Christian Bale fan at all, but he was perfect for Howl. And as with all the films, the artwork is exceptional. Ultimately I can say nothing bad about this movie. I may be a Studio Ghibli fan who was raised on Totoro, but I can honestly say that there’s nothing bad about this movie. Watch it!! !